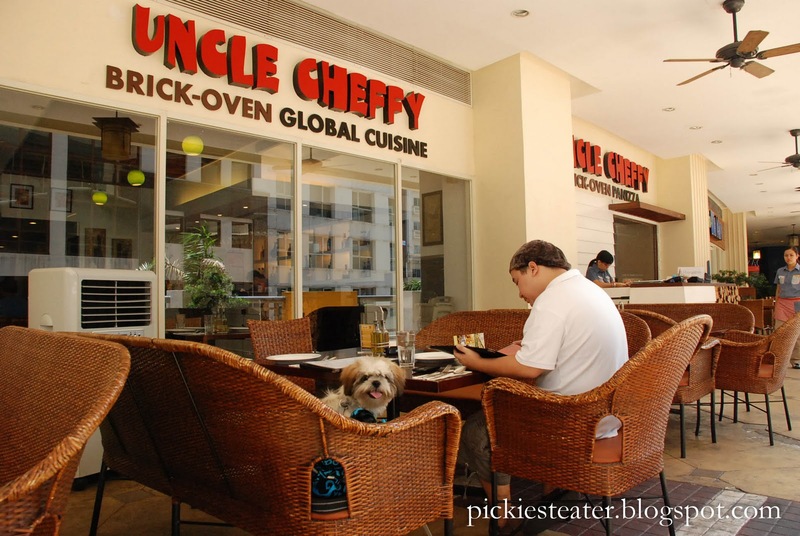 THE PICKIEST EATER IN THE WORLD: SCHATZI MEETS UNCLE CHEFFY ! Uncle Cheffy Gets a Tongue's Up from Schatzi! So we knew we were going to Eastwood, but WHERE in Eastwood was still a mystery. 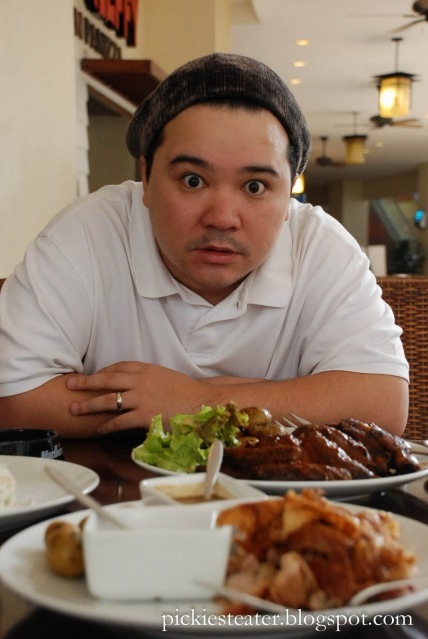 A workmate of mine suggested Uncle Cheffy, so I immediately looked it up. I was honestly quite baffled that I hadn't heard of the place before.. Not even in passing. After doing a little research, I decided that this was the chosen one for the first stop of "Schatzi's First Ever Day Out"! It couldn't have been a more perfect day for Schatzi's first day out. 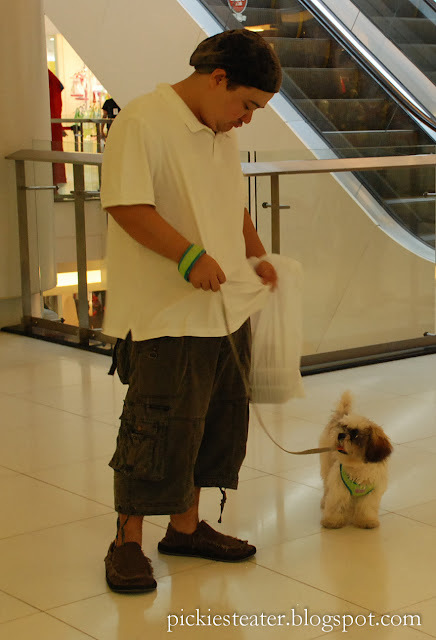 The sun was out and their were dogs all over the mall, which caused Schatzi to go into a hyper frenzy every time he would see one. 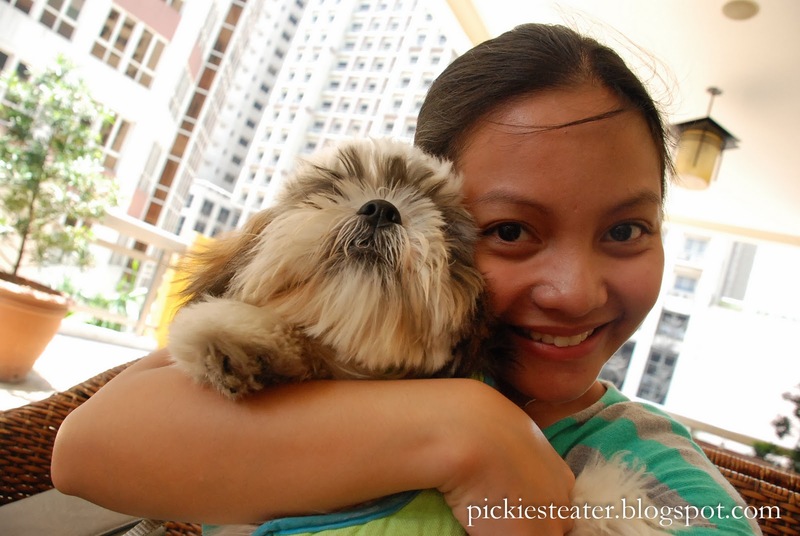 More on kulit Schatzi later..
Me with my Schatzi, the most sosyal dog ever. Seeing that it's at the far end of the new building of Eastwood that I had never been to before, it kind of made sense that I had never heard about it before (no excuse though.. I'm the pickiest eater in the world, so more is expected of me). Thankfully, there was enough breeze to not make the outside area feel like the Sahara Desert (No way their ceiling fans were gonna cut it on a hot day like that), and the table our waitress gave us had one of those air cooler thingies right in front of us so it was all good. Nice decors. All I was interested in was the aircon hehe. 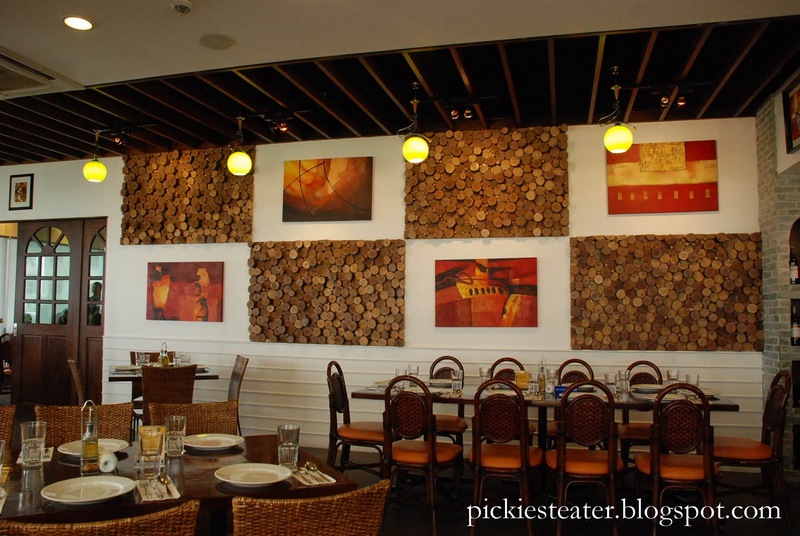 Just like last week's post (which actually was Day 2 of Schatzi's holiday), I can't really give an in-depth assessment of the interiors because I stayed outside, but I must say it had a clean, homey feel while maintaining a modern look to it. Outside, the chairs we sat on reminded me of a garden lawn, but were very comfortable as well. (I love chairs that allow you to slouch) It made me feel we were on a more sophisticated picnic than a lunch out at a mall. Tunnel vision.. where do I begin.. Since I take my Picky Eating very seriously, I knew what we were going to order as early as the night before. I was a little bit wary about ordering the Garlic Studded Pork Belly Lechon (P95 per 100 grams), because of an experience I had with a workmate involving dishes that are priced "per 100 grams". My buddy "Papa Joe" and I ordered a steamed fish from a popular restaurant, which was priced "per 100 grams". Considering the fact that we were starving, we completely forgot to ask an estimate of how many grams a standard order was. 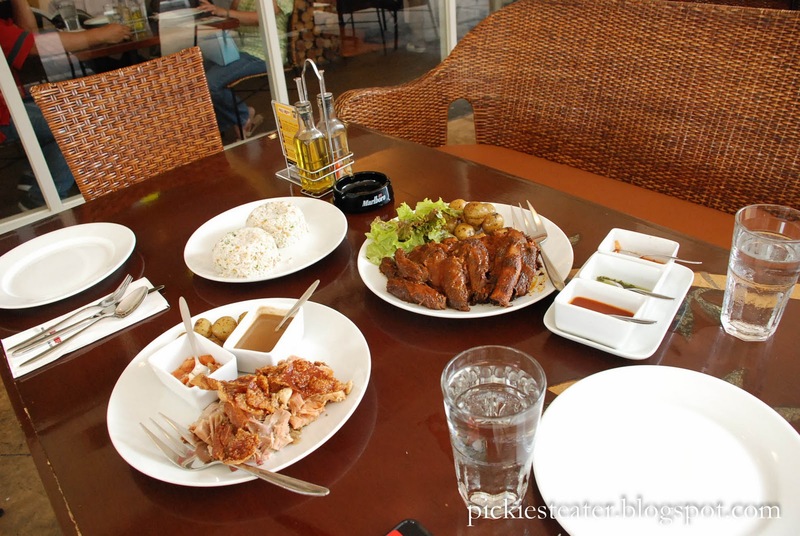 Long story short, we ended up paying over P700 bucks for a steamed fish dish. (At that price I could've gotten a decent steak somewhere else.) Needless to say, the dish was actually excellent, and only the fish bones were left on the plate. P95 per 100 grams, sounds like a pretty good deal, but it would all rely on how big their standard servings were. 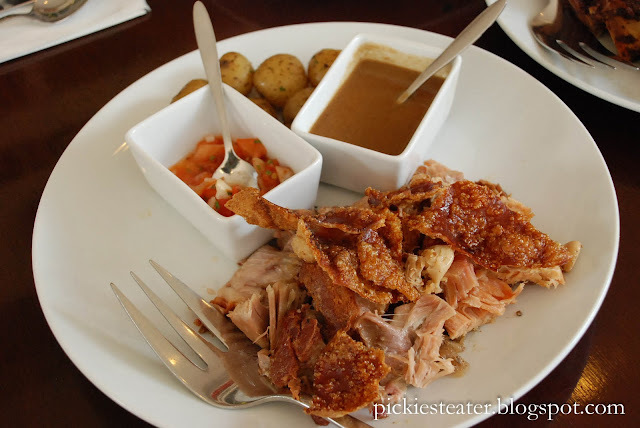 Pork Belly with Lechon Skin? Lethal combo. I was pleased to find out that YOU decide how many grams you want, with a minimum order of 200 grams. Even at the minimum, it was still a rather large order that could easily feed at least two people. But there was a slight problem. I didn't like the order so much. The dish had a few problems. The first being, considering the meat was "Garlic studded", it lacked flavor including any semblance of garlic. I was half expecting a burst of garlic in my mouth after every bite, but it fell disappointingly short, to the point of being rather bland. Neither did I see any traces of garlic on the meat itself, or even on the plate. Also, for a pork belly dish, it lacked alot of fat. And, I know it said it on the menu, (so i shouldn't have expected anything more), but I think they should've come up with something a litle bit more creative than liver sauce (Or in layman's terms, "Mang Tomas") and tomato salsa. The skin was crispy and quite yummy, I'll give them that, but overall, I wasn't satisfied. Ribs. Potatoes. And salad. One of these things do not belong. Our other order was the Memphis Barbeque U.S. Beef Rib Fingers. 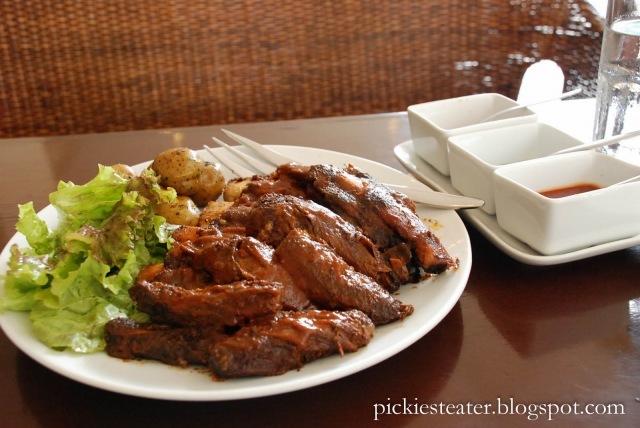 These glorious 1 kilo of ribs is a pretty good deal for P595! The order comes with marble potatoes, a side salad (which was technically just a few leaves of Romaine lettuce but I honestly couldn't care less), and three different sauces (which I'll elaborate more on later). The ribs were really soft and tender, and a pleasure to eat. The Memphis rub base sauce was pretty potent stuff, giving the ribs a rich, tangy flavor. My only comment would be, I wish they used ribs with more fat. Hehe. Don't get me wrong, these ribs were laced with fat as well.. just not enough for a Picky (and unhealthy) eater like me. Though the Ribs came with three different types of sauces, the Memphis flavor is so strong on its own, I ended up forgetting to put it on the ribs. Instead, I used it on the Pork Belly. 1 Kilo of ribs. nuff' said. 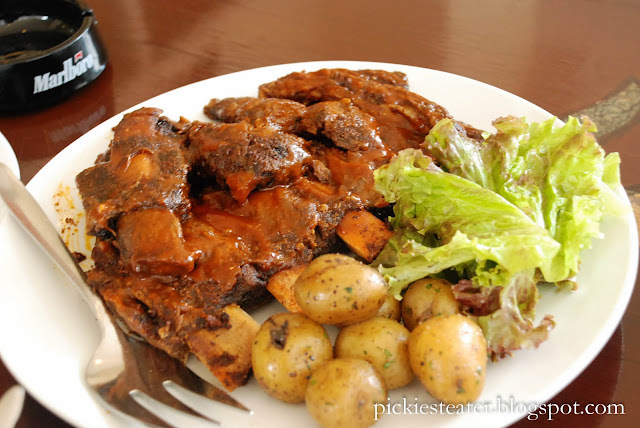 I was expecting the Marble Potatoes to taste bland, but it was seasoned really well with just the right amount of salt and pepper to make it a perfect compliment to the ribs. I was actually really tempted to ask for a little butter, but my shyness got the better of me in the end hehe. I was also disappointed that the meat wasn't served on a wooden slab like it was in the promo picture I saw. Not for any other reason than it looked really cool. Funny story.. As I mentioned earlier, The Memphis Beef Fingers came with three different sauces. One I recognized as Tomato Salsa (similar to that of the Lechon Belly) and the other through sight and taste, was Pesto. The third looked like a tomato based sauce, which would mean i couldn't eat it, but I wanted to know exactly what it was - just to be sure, so I asked the waitress. As attentive as our waitress was to our needs, she unfortunately seemed to be equally clueless to the items of menu of the restaurant she works for. I asked her, " What kind of sauces are these?" The look on her face reminded me of what I might have looked like whenever I was called upon during Senior Year Calculus. 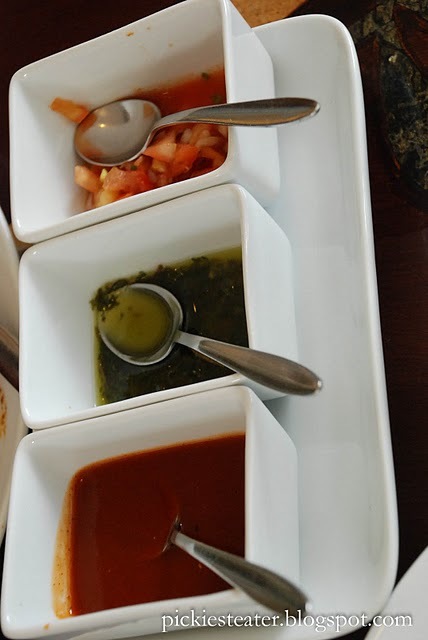 She looked at me with frightened eyes and said, "Three types of sauces, po." Clearly she had no idea as to the answer I was looking for, I thought I'd help her out. I pointed out the sauces to her one by one and said, "This is Tomato Salsa. This is Pesto. What kind of sauce is this?" . I was hoping since I eliminated the number of questions she'd have to answer, she would at least get this right. The look on her face however, was so unmistakeably lost, I was half-expecting the lights to dim and the spotlight to go on her as I asked her if she wanted to ask the audience or phone a friend. Her answer? "Sauce for the Beef Ribs, po." Serves me right for asking such a dumb question, right? Me being me, I couldn't let it go. I gave her a patient smile once again, and said, "Yes I understand that. But what is this sauce made of?" Do you remember when you were young and your parents caught you cutting classes or breaking curfew, and they ask you to explain why you did what you did, and you just start rambling on incoherently hoping some way, or somehow, whatever it is your saying will find a way to make sense? That's what she sounded like. She explained to me that the Red sauce is usually put on the ribs and that it was one of their best sellers, and "Masarap Sya". But.. umm.. I kinda knew that already. So with my patience wearing thin, I asked her one last time, "So what's it made of?" I could see her whole spiel on the ribs gave her a little more confidence, so she took a deep breath and answered, "Made with ingredients, po." Wow. "Made with.." wait for it............ "Ingredients"? What did she THINK I thought the sauce was made with? "Love"?? I myself took a deep breath and said, "Please get me the menu." with the best fake smile I could pull off. It was obvious she couldn't wait to get out of there too, because she left a dust cloud where she had been standing just a moment ago (and I could've sworn I heard her go "Meep Meep"). She also sent another waitress to our table with the menu (which incidentally, also doesn't say what the third sauce is). I may not have not have been happy with the lechon belly, and the waitress won't be getting her Masters Degree in BBQ Sauces any time soon, but I do want to go back to Uncle Cheffy to try their Brick Oven Pizzas (we were supposed to order the all meat one but it really would've been over kill) and the other dishes, like the Hawaiian Duck Barbeque, and the Lamb Breast Provencale (Sorry Leslie, but lengua just ain't my thing hehe). 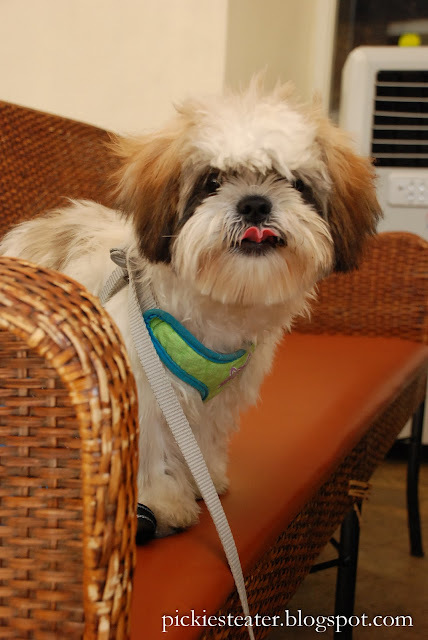 Don't stick your tongue out at me, young man! 1) Rina: I Love you! 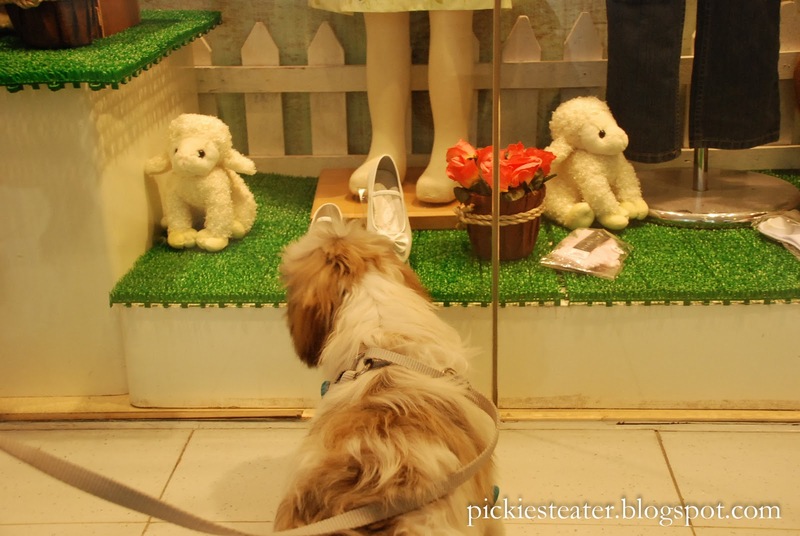 I'm going to hug you, and kiss you, and call you "Schatzi"!!!!!! Schatzi: Can't... breathe... Mommy.. Choking.. me..
production of "Of Mice and Men"
Schatzi wanted to play with the stuff toys cuz he thought they were puppies. The poor guy even bumped his head on the glass window. hehe. 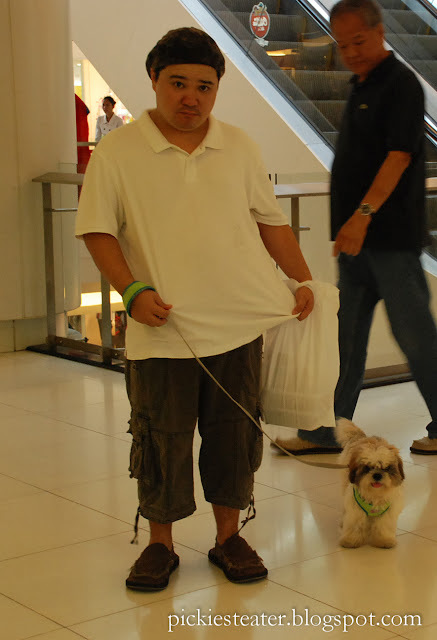 to be extra careful whenever I wear white. I carried Schatzi down the escalator, not knowing his feet were really filthy. You know he's looking at me really guiltily, cuz he knows he messed up. Then we both realize Rina is looking at us, and NOW we're BOTH in trouble. 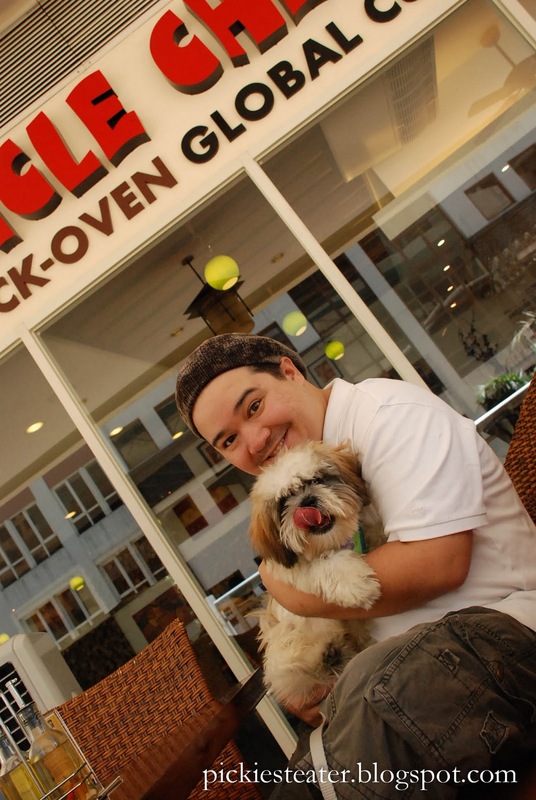 Okay leave the lengua to me, but oh my, you have to go back to Cheffy for the rolled pizza! When I'm there there's always someone celebrating their birthday, and their complimentary slice of birthday cake is really good. Again I emphasize I am the worst at remembering the names of dishes and everything in them, but it's ice-creamy and delicious. How cute is Schatzi! Love the name, guessing it's from the German word and you added the "i"? :) Love the photo story in the end haha. I definitely wanna go back for the pizza! We were too stuffed to order dessert, but now I really regret it.. hehe..